Located 1 km from the village of Lagrand, VVF Villages Le Plateau Provençal is composed of two hamlets of 20 pavilions each. 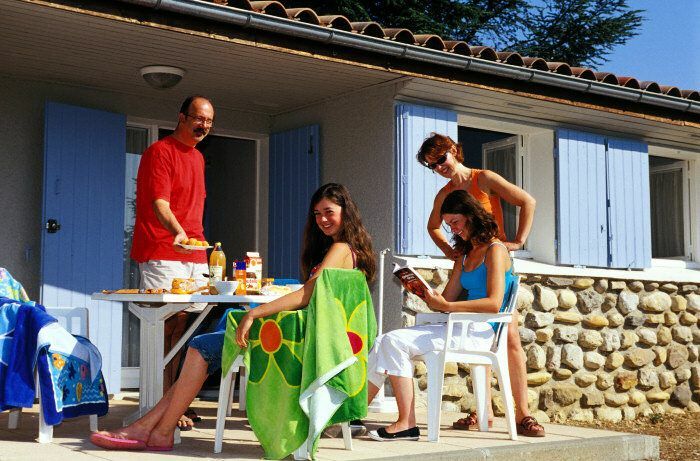 Enjoy all the comforts of a Provencal holiday village for a family holiday in the fresh air, between swimming in the Gorges de la Méouge after climbing Orpierre. For your relaxation, the village offers a heated outdoor swimming pool with a children's pool. In addition, you will discover many leisure facilities for the whole family: a reading corner, a play area with foosball, a multisports ground, a table tennis area, and a playground for children. Think about it! The village is located near a body of water and the climbing site of Orpierre. No less than 1,000 km of marked trails await mountain bikers. During the day, a sightseeing appointment, a small tour to discover the surroundings, an organized visit in the village, and activities (with participation) supervised by external service providers. In the evening, a convivial meal (grilled meat or regional specialties or terroir - with participation) followed by a fun or festive animation time (game, dance ...), discovery evening chat with a local child, storytelling or an animated walk, projection on the region ...). For your comfort your establishment offers various services such as the rental of towels * and bed linen *, household packages * or baby kit (folding bed, high chair, baby bath). It also has an automatic laundry * (with washing machines and dry linen) free wifi access in common areas and free parking. Two-room apartment of 27m² for four people including a living room with a sofa bed, a bedroom with two single beds and a bathroom with sink, shower and toilet. Apartment with a kitchenette with a mini oven, kitchen utensils and crockery for 4 people. Terrace with garden furniture.